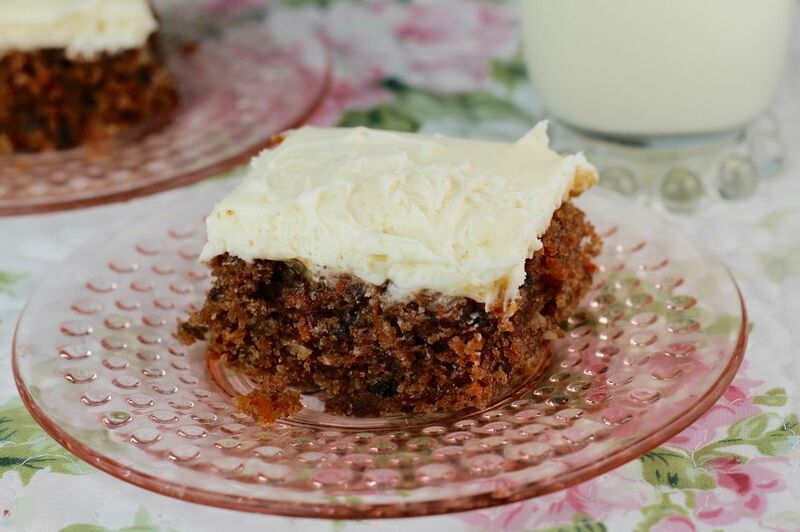 This is the carrot cake recipe best known for bringing anyone out of a foul mood. Yet it's easy to make, once you get the carrots shredded! I believe that baby carrots, although truly a pain to shred, are the secret to this recipe. They are more tender than regular carrots, with a sweeter flavor (even though they are just well trimmed regular carrots!). The cream cheese frosting is essential to this cake. No other frosting will do. The slight tang and the richness the cream cheese adds to the frosting is incredible. Preheat oven to 350 degrees F. Shred baby carrots (this takes some time, but is well worth it). In​ a large bowl, combine oil, sugar, brown sugar, vanilla, and eggs and beat well. Stir in half of the flour, baking soda, cinnamon, and salt and mix well. Add carrots and beat well. Then beat in remaining flour. Stir in 1/2 cup walnuts and mix well. Pour into 13x9" pan and spread evenly. Bake at 350 degrees F for 45-55 minutes until dark golden brown and cake springs back when lightly touched in center. Cool ​the carrot cake on a wire rack. Fold walnuts or coconut into Cream Cheese Frosting and spread over cooled carrot cake.